NMORS Signal Peak Challenge, NM : Team Aggress! 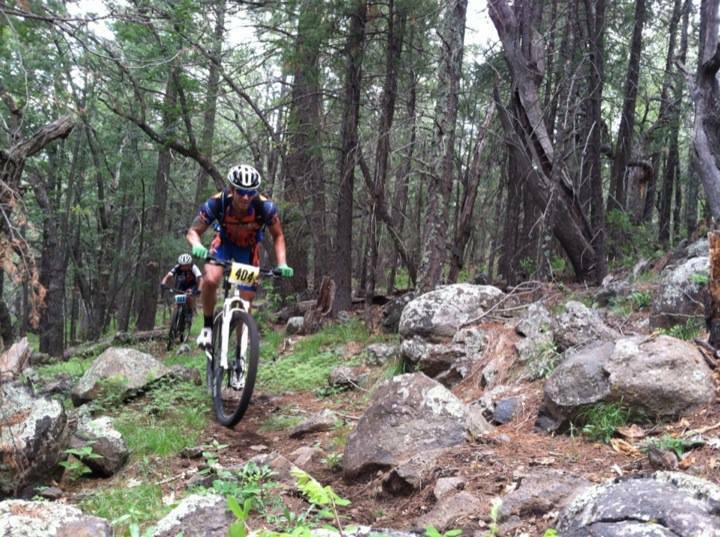 On August 18, 2013 @ 9:04 a.m., Robert and I started our MTBike race in Signal Peak, NM, eight miles north of Silver City, NM, in the Gila National Forest. The largest turnout that I recall for the singlespeed category, with representation from AZ, NM, and TX. The start of the race is a steep, rutted, jeep road that tests your mental fortitude and power output, putting you in the red from the gun. I got a good jump with another ride from Taos, NM. The scouting report indicated he was the rider to beat and was leading the points category, including the altitude advantage and a season pro. The start is above 7000 ft and travels through numerous power climbs on a FR with challenging terrain to the summit of 9000 ft. I sat on his wheel which afforded me the opportunity to attempt to capitalize on his weaknesses. I cleaned some potential hike-a-bike sections and put a significant gap on him and the rest of the group of 14 riders. My goal was to reach the summit with a small gap. 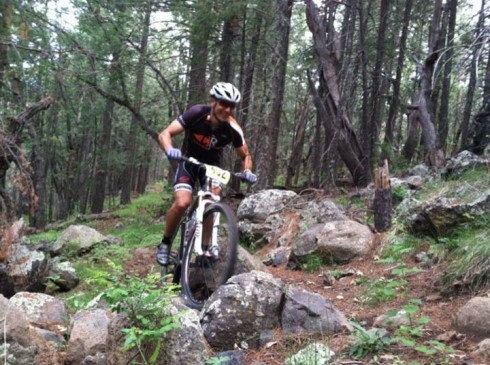 The climb takes approximately 50 minutes and leads you into a 3-mile stretch of sweet high-alpine singletrack that is perhaps the most challenging section of the race. The pics depict the obstacles on this stretch of singletrack, except the tight-off camber drop off sections. Courtesy of Paula, she staged herself on the most grueling section of the trail. By that point of the race, you were forced to display your best poker face impression for the mug shot. Paula reported I had a 5 minute lead on the 2nd place rider at that time of the race. The descent on the CDT is the most rewarding section of the course, with fast-swooping singletrack and tight technical swithchback. I continued to push as hard as I could, and, tor the first time in that race, my legs felt empty. I had caught several Cat 1 and Pro open geared riders in that 10-mile stretch. They had started approximately 8 minutes before our wave. They were good sports and allowed me to pass through. I caught a Stan’s No Tubes racer on the final fun downhill, which consists of rollercoaster type jeep ride which encourages big air. He was on a full suspension rig so I encouraged him to take lead. I got distracted at one point with spectators on both sides of the trail, catching huge air and I believe a camera shot from one of them. A big cheer followed, and perhaps one of the most adrenaline rushes of my life. The legs were back for the next two sections of steep, off-camber, climbs for the final leg of the race. After numerous water crossing and a bombing single track descent, I sprinted to the finish. I finished the race with not my fastest time, but satisfying result since I had not officially raced in over a years time. The race averaged 7800 ft and over 3500 ft of climbing in a 22-mile loop. The average finish is 2:20 and I finished in 2:02. Results are not up yet, however, I believe I finished 9 minutes of the second place finisher. Robert had a great run for a podium spot, however, a catastrophic mechanical kept him from finishing the race. He can chime in on his experience. Next up, a 100 miler mid September.